The circuit should use NPO capacitors and metal film resistors for temperature stability. Adjust the variable capacitor for a minimum voltage reading at the VNULL point. Use a high input impedance voltmeter for minimum loading. 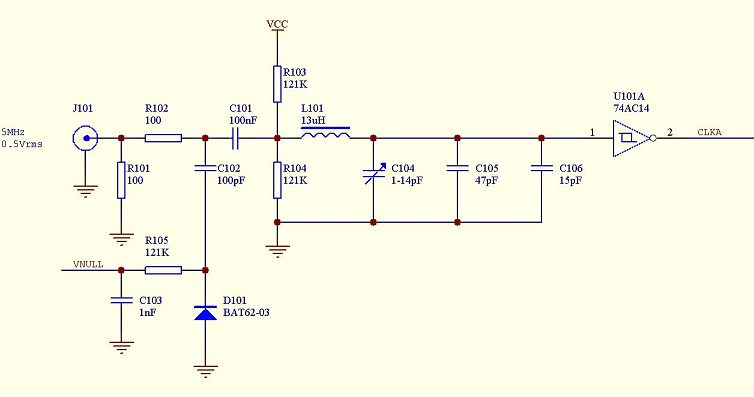 Use of inexpensive CMOS gate as an analog comparator. CMOS Schmitt Triggers have relatively stable threshold voltages over temperature, but not well specified from part to part. The bias point of the CMOS input is referenced to the supply voltage, improving the stability when supply voltage changes. 50 ohm input impedance (note that the input resistor can be replaced with an attenuator if the oscillator provides more than 0.5 V rms). Low pass characteristic removes harmonics. You only need a DVM to adjust it. Even though the circuit is not very sensitive to supply voltage variations, in order to get all the performance available, make sure the supply voltage is ripple free and well regulated. Here is the frequency response of the circuit, modified for 10 MHz operation (change inductor to 7uH, change capacitance to 35 pF) and modeled with Linear Technology's LTSpice (Ref 1). 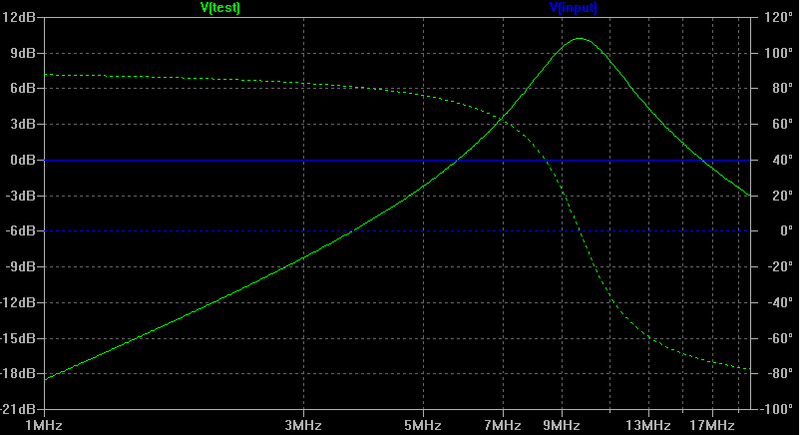 You can see the circuit has about 2 MHz bandwidth at 3dB, providing a moderate Q and low sensitivity. Here is my circuit, designed to take advantage of off-the-shelf 10.7 MHz IF transformers, and also intentionaly providing somewhat higher than 50 ohm input imdedance (so that the 10 MHz signal can feed other circuits without excessive loading, such as driving a Time Interval counter in order to assess its performance, more on that later) and also in order to accomodate oscillators that provide more than 0.5 V rms. If 50 ohm input impedance is desired, it is easy to place a resistor in parallel on the input. The value will depend on the value of R3 and should be determined experimentally. Use commonly available IF transformer (make sure to use a quality part). Oscillator loading and Q somewhat independently adjustable via R4 and R3 respectively. Fast comparator (LT1016, (Ref 2) has no hysteresis, making performance more reproducible. 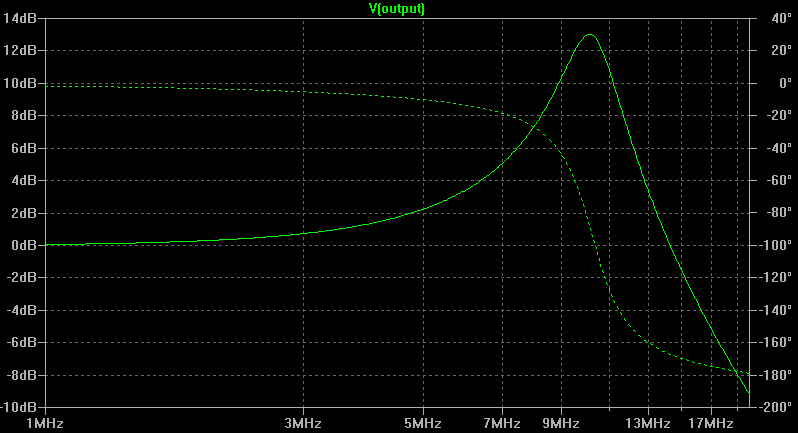 Bandpass response does not attenuate harmonics as well. Harder to model, unless complete specifications for the transformer are available (click here for the complete schematic of the SwitcherCAD model I used). There are a couple of resistor values to adjust, depending on how much signal you have available and the particular type of transformer. Resistor R3 defines to a large extent the Q of the circuit. It's value should be low enough to dampen the transformer and reduce the temperature sensitivity. Resistor R4 is adjusted to adjust the level drive to the comparator as high as possible without exceeding the comparator common mode specification. 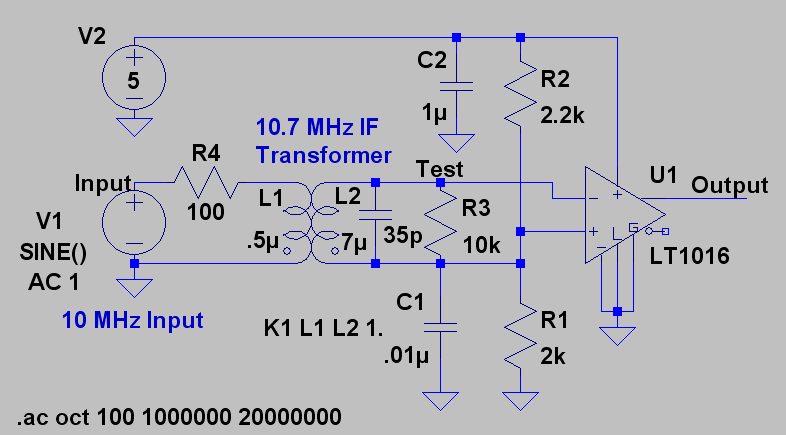 Use a signal generator to drive the circuit with a level comparable to the output level of the intended crystal oscillator. Look at the signal on the inverting input of the comparator with an oscilloscope and a low capacitance probe. Adjust the transformer to peak the response. Make sure the transformer does not bottom out before reaching 10 MHz. Adjust (typically decrease) the value of R3 until you obtain a 3dB bandwidth of about 2 MHz (peak to peak voltage at the input of the comparator drops by about 30% at 9 and 11 MHz compared to the level at 10 MHz). Adjust (typically decrease) the value of R4 until the signal on the comparator input is about 2V p-p. You may have to go through steps 4, 5 and 6 more than once. The final adjustment of the transformer is done by comparing the input and output signals with the oscilloscope and adjusting the transformer so that the signals are in phase (output switches when the signal is at zero crossing). At that point, you will have the best rejection of the effects of amplitude variations on the phase of the signal. Once you have determined the values of R3 and R4 for a given transformer type, you can build a number of units and all you will have to do is adjust the transformer for zero phase shift.